What did EDF energy promise me? I switched energy suppliers at the start of the year. I've never done this before and they say if you haven't done that you're bound to save money. I used Martin Lewis's Cheap Energy Club and it seemed pretty good. 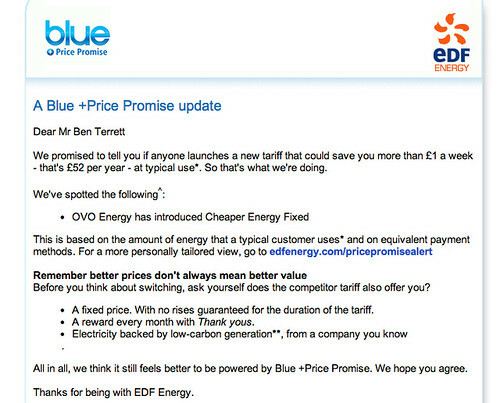 I chose to switch to EDF, which was cheaper, and under their "price promise" promised to "let you know if a competitor or EDF Energy launches a product that's cheaper by more than £52 per year". Which is nice, but yeah, whatever. Until today when they emailed me. Which surprised me. Very good. 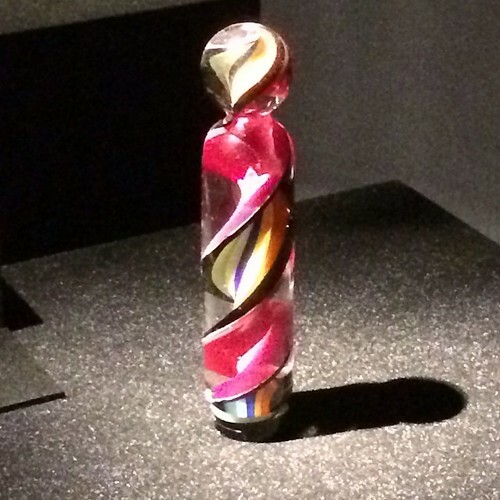 "Paul Smith collaborated with Evian to design a limited edition bottle." No he didn't, Evian gave him some money and someone suggested putting the brand assets on the bottle. "...imbuing the bottle with a sense of energy and fun." 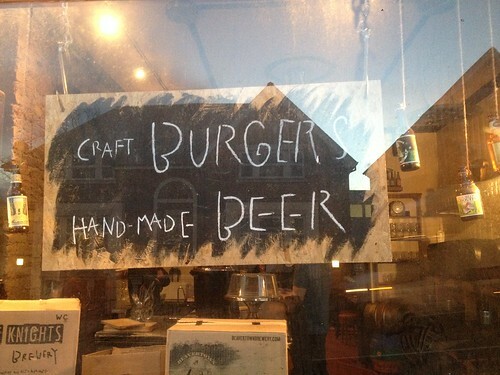 No it doesn't, it imbues the bottle with a sense of laziness and a lack of creativity. I love Paul Smith. But designers should stop doing these terrible, lazy "collaborations". Set to Plain Text. So useful. 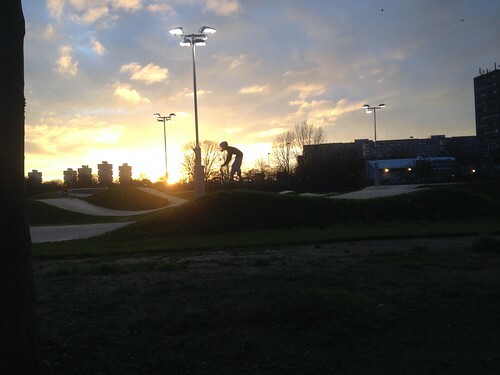 There's a newish BMX track I pass on the way home, in Burgess Park. It's always packed and looks like a lot of fun. The other night in the sunset it looked great. I stopped to take a few photos, but then I thought I bet loads of people have already done that properly. I was right, it's all over flickr. I was inflating my tyre in a bike shop the other day as shown in the picture above. I always do it with the value up there because it means I have to reach down less. The cycling technician said to me, "why are you doing it that way? Do you like working against gravity?". Putting aside his record shop grade sarcasm, he encouraged me to infalte my tyres with the value at the bottom, so that gravity works with the pump. he's right. It's a good idea. Just saw the Lego movie. A really nice touch was the inclusion of classic Lego characters like this 80s classic space guy. I had a few of them as a kid. Remember how the bottom chin bit of the helmet always broke? The chin bit is broken throughout he movie. Nice touch. Went to see In The Making the other day with some of the design team. Organised by Barber Osgerby - it's really good. Shows you how (fairly) everyday stuff is made by freezing production at a certain point and show you that. 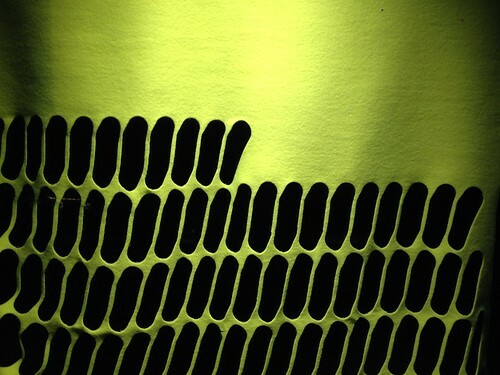 Here's a tennis ball at (I can't remember but say...) 30%. Here's a marble at (say) 50%. Photo by Tom Armitage. As usual it's tiny. Tinier than a normal DM exhibition, it's in a corridor really. But worth a visit if you're nearby. When we made Things Our Friends Have Written On The Internet 5 years ago we printed 1,000 copies and gave them away for free. We wrote a blog post and asked people if they wanted one. We "sold out" in just over 24 hours. 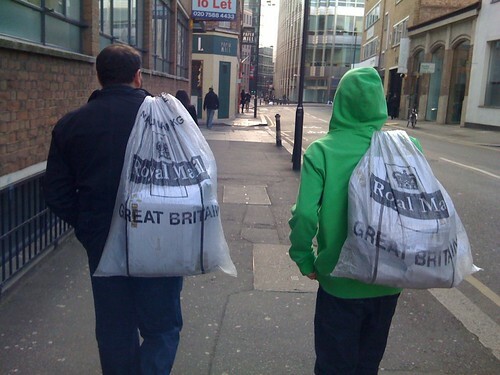 But then it took us two weeks to get all the papers sent out. Yesterday we launched a service on Newspaper Club that will let you sell papers directly from the site. We’ll handle the payments, printing and delivery — you just need to design your paper. You can make a paper + sell it to 1,000s - no setup fee, no paperwork, and no minimum sales. You can sell one copy, you can sell a million copies. 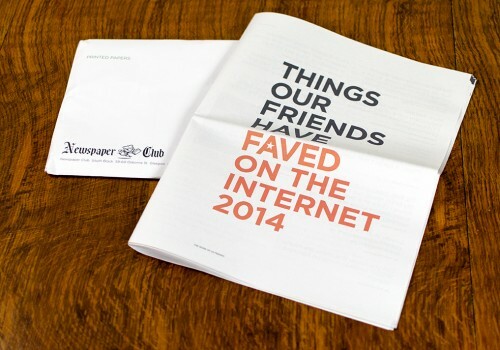 The first paper available to buy is Things Our Friends Have Faved On The Internet. We wanted to do one similiar to Things Our Friends Have Written On The Internet but no-one writes anything anymore. They do fav stuff though, so we made a newspaper out of Stellar feeds. It even has a massive picture of a fox. Find out more here and buy the paper here it's only £5.25. There's something about what we're doing at GDS that's making us unlearn our habits. Two designers recently have talked to me about how they've had to change how they work since being at GDS. Organisations survive on habits. They find what works and they make that a habit so it can be repeated. Manufactured. Sold. And then those habits can become the problem, as Shirky says "Institutions will try to preserve the problem to which they are the solution." 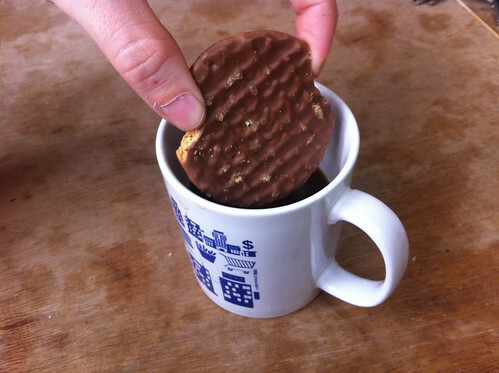 Often when you're trying to fix a problem what you need is to do things differently. To break the habits a little. What helps us here is the focus on user needs. What is the user trying to do? How can we help them do that as simply as possible? Forget the habits and structures and mental models that exist, even if they exist in how you work, find the user need and then do that. Focus on that. Because maybe the way you work is part of the problem. This feels like three half posts made into one, but anyway. A teeny bit related this blog post from the brilliant Leisa Reichelt "There is no UX, there is only UX."